Canyons and gorges are geographical landforms belonging to the broad categories of valleys. A canyon in Jasper, Alberta. Canyons and gorges are geographical landforms belonging to the broad categories of valleys. Morphologically, they are either V-shaped or U-shaped with a down ward fold extending below the earth surface. They are classically low areas and could be separating mountains or hills. More often than not, canyons and gorges have rivers streaming through them and are usually very long and narrow. They are often considered deep valleys with very steep escarpments. Though these terms have been utilized interchangeably, there exists some critical differences between a canyon and a gorge in terms of size, mode of formation, localization and preference of usage of the terms. In terms of the proportions of the two, a canyon is considered larger than a gorge. They are both deep valleys, but a canyon is often wider compared to a gorge. 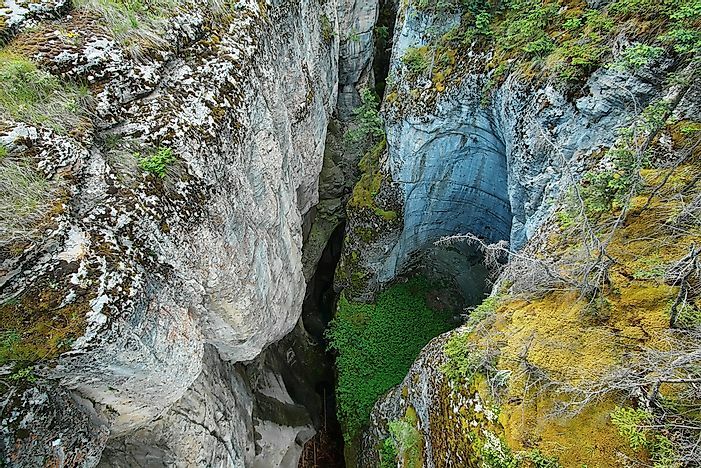 The term gorge is at times used to describe ravines which are narrower than canyons. Canyons are mainly localized to the arid areas while gorges can be found in temperate areas like between mountain ranges. While water or lava flow is implicated in the formation of gorges, erosion from a plateau level coupled with resistance of hard rocks to weathering is the manner in which canyons are formed. Often, gorges are associated with rivers while canyons are not. Despite the geographical differences, in the United States the term canyon is widely applied to refer to both canyons and gorges. In Europe however, the term gorge is more preferred. Erosion, is the weathering process that leads to the formation of canyons. This begins at the table land level and continues downwards. Hard rock is resistant to this weathering process, thus remains on the escarpments in form of granite and sandstones. Major canyons in the world include the Yarlung Tsangpo Grand Canyon in the Unites States of America, the Fish River Canyon in Namibia and the Grand Canyon of northern Arizona. Gorges form via three forms of natural forces: erosion, geological uplift and glaciers melting. Erosion and washing away of the sediments caused by rivers and streams in valleys is responsible for formation of most gorges in the world. The Talari Gorges in Mali were formed in this manner. Upward movement of the Earth’s surface termed the geologic uplift has been implicated in formation of these land forms. In most cases, geologic uplift works hand in hand with erosion. These two forces led to the formation of Macocha Gorge in Czech Republic. The Colombia River Gorge in Washington was formed via melting of glaciers, which is the third force that leads to gorges creation. Canyons and gorges are a geographical fascinations known for tourist attraction which often contributes to countries’ economies. They also provide education regarding changes in land forms in their tales of modes of formation. Some of these landforms are important archaeological sites documenting early human life by way of remains of ancient plants and animal remains. An example is the Olduvai Gorge cited by the Leakey family as famous for ancient tools and fossils. Dams built along the rivers streaming through the gorges are often important sources of energy, example being the Three Gorges Dam.